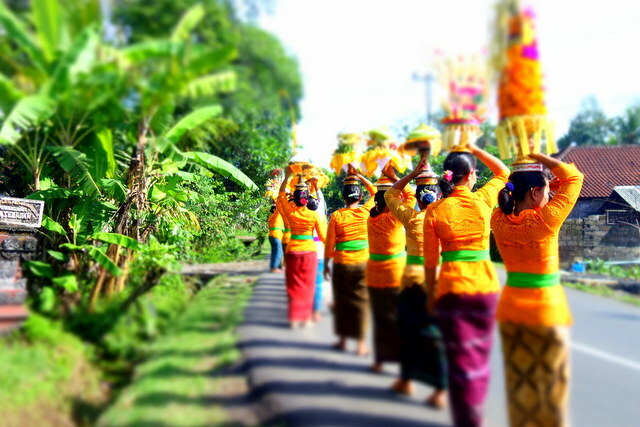 It was a glorious, dazzling and typically hot morning in Ubud when we set out to Pejeng for the rarest of celebrations; a once-in-a-lifetime Odalan (bi-annual temple festival), that is celebrated only once every 100 years. 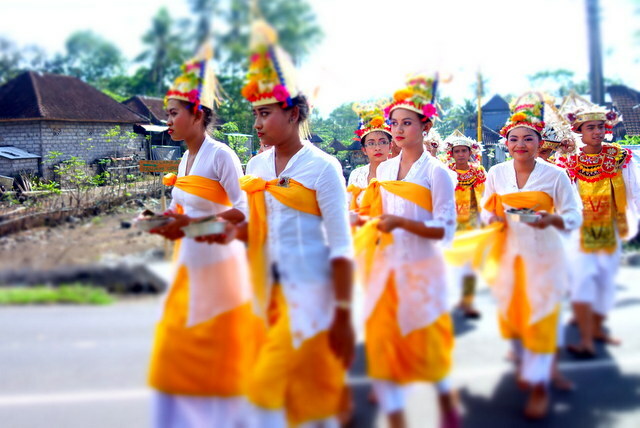 The women were dressed in Pantone-perfect yellowish-orange kebayas and sarongs, the priests all decked out in whites. 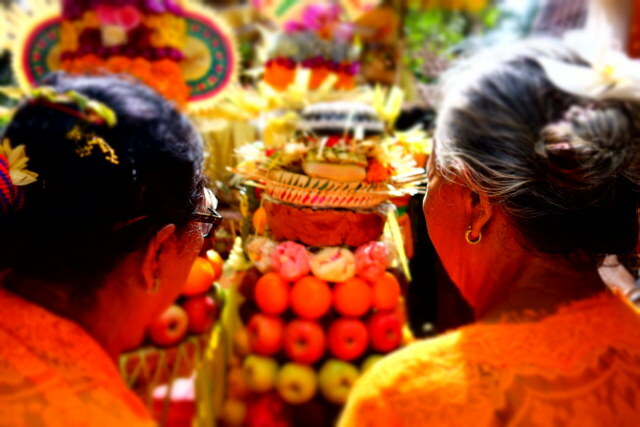 An abundance of flowers and offerings were paraded around the village until they arrived finally at the family compound; and set out, in precise formations and layouts all around the family temple. Food and drink were served, then we waited for the music to begin and the dancers to arrive. 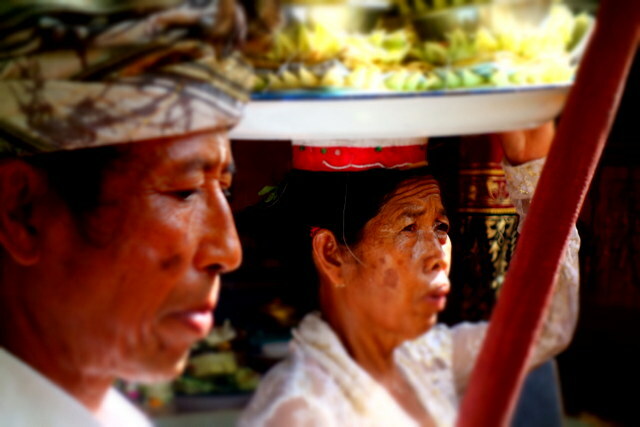 But alas, we’ve just entered Bali’s rainy season… with a vengeance. Less than two hours after we first joined the procession, the clouds moved in. Rain drops were followed by heavy rains, then claps of thunder, slices of lightning – and the grounds around us began to flood, causing flip-flops and offerings to be swept away. And without the rains, there would not be the beauty to inspire us. Though, to be fair, paradox can be pretty inconvenient at times. Thanks Bharat for your comments. Could be, but I believe that the rains are essential to Bali’s (and other) rice field culture which mitigates the inconvenience. Plus it tends to cool things down a bit from the typically blaring heat. 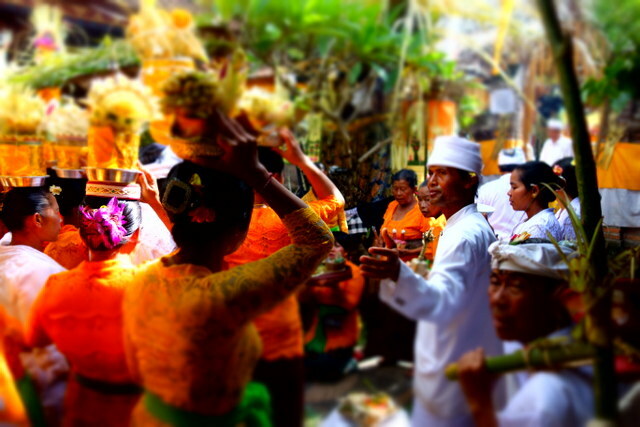 Also part of Bali’s sekalah/niskalah dichotomy – the seen and unseen, the good and evil. Have just visited your flickr page for the first time – really fabulous albums Amit!